In the northeastern part of Scotland lie the four counties of Aberdeen, Banff, Kincardine, and Angus. These counties touch the North Sea and all extend inland and have some high or mountainous country. They have been favored through the ages with a temperate climate and good crops, although the topography of the country is rough. Pastures do well in the area because of well-distributed rainfall. Plenty of grass, plus a nearly ideal temperature for cattle production, has made the area very suitable for some of the greatest improvement that has been made in our purebred breeds of cattle. The county of Angus was early noted for its production of potatoes, grain crops, and feed. This shire contains a fine expanse of highly cultivated land known as Strathmore, which is one of the very fine valleys in that part of Scotland and which has become famous in the history of the Aberdeen-Angus breed. The county of Aberdeen is the most productive agricultural region in Scotland and depends largely upon crops and livestock for income. The fishing industry, however, is stressed along the coastline. The tiny counties of Banff and Kincardine have long been known as livestock centers. Northern Scotland, although in a more northern latitude than the United States, has a more uniform temperature throughout the year. The Gulf Steam tempers the climate in the winter, and the summers remain cooler than weather commonly experienced in the United States. There are three distinct and well-defined breeds of polled cattle in the United Kingdom. These breeds are the Aberdeen-Angus, the Galloway, and the red polled Norfolk and Suffolk breed that is found in England. Polled cattle apparently existed in Scotland before recorded history because the likeness of such cattle is found in prehistoric carvings of Aberdeen and Angus. Historians state that there were hornless cattle in Siberia centuries earlier. A hornless race of cattle was depicted in Egypt by sculptors and painters of that ancient civilization. Some historians feel that the Aberdeen-Angus breed and the other Scottish breeds sprang from the aboriginal cattle of the country and that the breeds as we find them today are indigenous to the districts in which they are still found. Early Scottish Cattle. Although little is known about the early origin of the cattle that later became known as the Aberdeen-Angus breed, it is thought that the improvement of the original stock found in the area began in the last half of the 18th century. The cattle found in northern Scotland were not of uniform color, and many of the cattle of the early days had varied color markings or broken color patterns. Many of the cattle were polled, but some few had horns. The characteristics we commonly call polled was often referred to in the old Scottish writings by the terms of "humble," "doddies," "humlies," or "homyl." The presence of polled cattle in Aberdeenshire 400 years ago is proved beyond the shadow of a doubt, and it may generally be taked for granted that they were co-existent in various parts of northeastern Scotland, their purity being contingent on the degree of care exercised in breeding. Improvement in Scottish Agriculture. Apparently little attention was given to the breeding of cattle before the middle of the 18th century, but in the last half of that century, great progress was made in Scottish agriculture. It is not strange that, as farming practices were improved, men likewise sought to improve the livestock on their farms. It was only natural that breeders, in improving their cattle, would but cattle of similar kinds from adjacent areas, and as a result, the cattle of the Angus doddie strain and the Buchan humlie strain were crossed. Crossing and recrossing these strains of cattle eventually led to a distinct breed that was not far different from either type, since the two strains were originally of rather similar type and color pattern. The Early Herds. By the beginning of the 19th century, the polled cattle of the Buchan district had attained considerable favor as market cattle for the production of carcass beef. Among the polled herds of Aberdeenshire that were famous for such production in the early 1800s were those of Messrs. Williamson of St. Johns Wells and Robert Walker of Wester Fintray. The Williamson herd later supplied the herd of Tillyfour and, through it, the Ballindalloch herd with some of their humlies. In Angus, the herds of William Fullerton, Lord Panmure, Lord Southesk, and Alexander Bowie contributed many of the Angus doddies that later became prominent in the breed. Robert Walker of Portlethen seems to have been the principal cattle breeder in Kincardineshire. The Contribution of Hugh Watson. If any one person can be singled out as the founder of a breed of livestock, Hugh Watson of Keillor, who lived in the vale of Strathmore in Angus, is worthy of that distinction. If not the first real improver of Aberdeen-Angus cattle, he was certainly the most systematic and successful. Both his father and grandfather had been buyers and breeders of the Angus doddies. The family is known to have owned cattle as early as 1735. Hugh Watson was born in 1789 and, in 1808, at the time he was 19 years of age, he became a tenant at Keillor. When Hugh Watson started his farming activities at Keillor, he received from his fathers herd six of the best and blackest cows, as well as a bull. That same summer, he visited some of the leading Scottish cattle markets and purchased the 10 best heifers and the best bull that he could find that showed characteristics of the Angus cattle that he was striving to breed. The females were of various colors, but the bull was black; Watson decided that the color of his herd should be black and he started selecting in that direction. Mr. Watsons favorite bull was Old Jock 126 (1), 3 who was awarded the number "1" in the Herd Book at the time it was founded. The bull was bred by Watson in 1842 and was sired by Grey-Breasted Jock 113 (2). The bull apparently was used very heavily in the herd from 1843 until 1852 and was awarded the sweepstakes for bulls at the Highland Society Show at Perth in 1852, when he was 11 years old. A very famous cow also made considerable history in the herd at Keillor. This cow was Old Granny 125 (1), who was calved in 1824 and was killed by lightning when past 35 years of age. She is reported to have produced a total of 29 calves, 11 of which were registered in the Herd Book. A very large percentage of our living Aberdeen-Angus cattle trace to either Old Granny or Old Jock, or both of these very famous foundation animals, and most would trace many times if their pedigrees were extended to the foundation of the breed. Hugh Watson practiced the fitting and showing of his cattle more than was common by other breeders of his day. He made his first exhibition at the Highland Agricultural Society Show at Perth in 1829. During his long show career, he is said to have won over 500 prizes with his cattle and did a great deal to increase the popularity of the black polled cattle over the British Isles. Other Early Contributors. Lord Panmure established a herd of polled cattle in 1835, and not only operated a private herd but also encouraged his tenants to breed good doddies. William Fullerton, who was born in 1810, began to breed cattle in 1833. His most important early purchase was that of another Aberdeen cow named Black Meg. Black Meg 43 (766) is sometimes referred to as the founder of the breed, since more cattle trace to her than to any other female used in the origin of the breed. 4 She is the only cow to surpass Old Granny in this respect. Robert Walker of Porlethen founded his herd in 1818 and continued to breed cattle successfully until his death in 1874. Shorthorn Breed Threatens the Aberdeen-Angus. In 1810, the Colling brothers of England sold the famous Shorthorn bull Comet at $5,000. The publicity resulting from this sale naturally spread throughout Scotland, and many breeders looked with favor upon the use of Shorthorn blood in improving the native cattle. Subsequently good herds of Shorthorn cattle were established in Scotland, and the cattle were used in the improvement of native stock. The use of the Shorthorn cattle on the black native cows was a very common practice of the period for the raising of commercial stock. 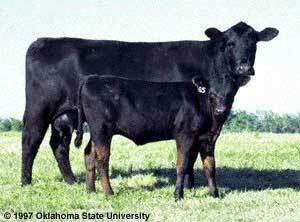 This practice of crossbreeding threatened the Aberdeen-Angus breed with extinction. The statement has been frequently made that shorthorn blood was introduced into the Aberdeen-Angus breed at an early stage of its existence. There is no foundation whatever for such a statement. The tribes from which the Aberdeen-Angus breed were drawn were supplying England with beef cattle for generations before what became the beef Shorthorn was taken across the Border into Scotland and improved into what is known as the Scotch Shorthorn. Of the Aberdeen-Angus pioneers, Hugh Watson had a certain number of Shorthorn cattle, but it is quite evident from his won remarks and his insistence upon the blackness of his Aberdeen-Angus cattle that he would never have permitted mixing them. And McCombie: when one or two farmers introduced the Teeswater or Shorthorn breed into his neighborhood he drove them out by completely dominating the local shows with his Aberdeen-Angus black polls. The feeling of the early improvers of Aberdeen-Angus cattle may be gathered from the fact that my own grandfather, who was one of McCombies friends and associates, would not allow anything but a black beast on his farm and in his old age when I was a young boy he would insist that if I ever became a farmer and wished to be a successful feeder of cattle I must stick rigidly to the Blacks. The Great Preserver. William McCombie of Tillyfour is regarded as the preserver and great improver of the Aberdeen-Angus breed. Fullerton and others had started the blending of the two types of cattle, which later became known as the Aberdeen-Angus, but this success was enlarged at Tillyfour. The master of Tillyfour was born in 1805 and died in the spring of 1880. Like his father before him, he had been a successful dealer in cattle before he began his operations in 1829 as a tenant farmer. Mr. McCombie is distinguished in the history of the Aberdeen-Angus breed because of his great foresight in planning matings, his careful management, his unparalleled success in the show ring, and in publicizing his famous cattle. Probably his crowning success in the show ring was at the great International Exposition held at Paris in 1878. There he won the first prize of $500 as an exhibitor of cattle from a foreign country and also the grand prize of $500 for the best group of beef-producing animals bred by any exhibitor. Not only did Mr. McCombie show in breeding classes but he also exhibited in steer classes at the market shows. Probably the most famous steer that her produced was the famous show animal Black prince, who won at the Birmingham and Smithfield Shows in 1867 when he was four years of age. From the latter show, he was taken to Windsor Castle for the personal inspection of Queen Victoria, and later her Majesty accepted some Christmas beef from the carcass of the steer. The English Crown has long been interested in livestock improvement, and Queen Victoria paid a personal visit to Tillyfour a year or two after the visit of the famous Black prince to the castle. Such a tribute to an outstanding breeder naturally attracted great attention to the already famous herd. McCombie had the further distinction of being the first tenant farmer in Scotland to be elected to the House of Commons. Aberdeen-Angus history may fairly be divided into two periods; the first, before William McCombies time; the second, since. That is as good as any other way of saying that the Master of Tillyfour-recognized cattle king of his day and generation in Aberdeen-Angusshire and of all Scotland-stands a very colossus upon any canvas which accurately portrays the original arrival of black cattle as a factor of world importance in the field of prime beef production. William McCombie always had utility in mind in producing his cattle, and his ideal beast seems to have been one with size, symmetry, and balance, yet with strength of constitution and disposition to accumulate flesh. Important Developments at Tillyfour. Although his original stock was gathered from many sources and his purchases were many, Mr. McCombies outstanding acquisition was probably the good yearling heifer Queen Mother 41 (348) at the Ardestie Sale. Mr. McCombie purchased the bull Hanton 80 (228), calved in 1853, from the breeder Alexander Bowie. 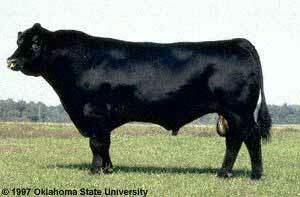 This bull was a grandson of Old Jock 126 (1) and was said to have weighed a ton at maturity. Despite the fact that he had scurs, he was a great show bull and was exhibited widely by Me. McCombie. The bulls success, however, was more pronounced in the breeding pen, and he probably made his greatest contribution to the breed through his double grandson, Black Prince of Tillyfour 77 (366), calved in 1860. Few, if any, cattle of the breed are living today that do not trace at least a dozen times to Black Prince of Tillyfour. It is difficult to say how much contribution Mr. McCombie made to the Aberdeen-Angus breed through his successes in the show ring, but he outstripped all of his competition in England, Scotland, and France. Consequently, the name of Aberdeen-Angus became known on an international basis. It was on the farm of William McCombie that the Aberdeen-Angus breed really took shape, because prior to his time, people spoke of the cattle as Aberdeen and Angus. In his herd was found the justification for leaving out the "and" and replacing it with the hyphen that has become familiar. At Tillyfour, the master breeder molded the two original strains into one improved breed superior to either of its components. There is no question but that the "preserver" of the Angus breed left the breed far better than he found it. The Ballindalloch Herd. Another very famous Aberdeen-Angus herd in Scotland was that of Ballindalloch, but the origin of this herd is lost in the mists of antiquity. It was probably first founded by Sir John MacPherson Grant, but it was not until the time the farm came into the hands of Sir George, a son, that systematic breeding was started. Sir George drew heavily on Tillyfour cattle in establishing his herd. It was very fortunate for the breed that the Ballindalloch herd was kept in the family for over three generations. The main herd was dispersed on August 8, 1934, but it had already left a great imprint on the Aberdeen-Angus world. Not only was the Ballindalloch herd the outstanding herd in Scotland but it mush also be given credit for having furnished a great deal of very valuable foundation stock to the herds of the United States and other foreign countries. The First Angus In America. When George Grant transported four Angus bulls from Scotland to the middle of the Kansas prairie in 1873, they were part of the Scotsman's dream to found a colony of wealthy, stock-raising Britishers. Grant died five years later, and many of the settlers at his Victoria, Kansas colony later returned to their homeland. However, these four Angus bulls, probably from the herd of George Brown of Westertown, Fochabers, Scotland, made a lasting impression on the U.S. cattle industry. Early Importers and Breeders. 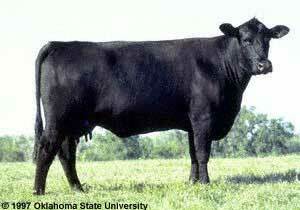 The first great herds of Angus beef cattle in America were built up by purchasing stock directly from Scotland. Twelve hundred cattle alone were imported, mostly to the Midwest, in a period of explosive growth between 1878 and 1883 . Over the next quarter of a century these early owners, in turn, helped start other herds by breeding, showing, and selling their registered stock. Briggs, H.M. & D.M. Briggs. Modern Breeds of Livestock. Fourth Edition. Macmillan Publishing Co. 1980 (reprinted with permission from Dr. Briggs).